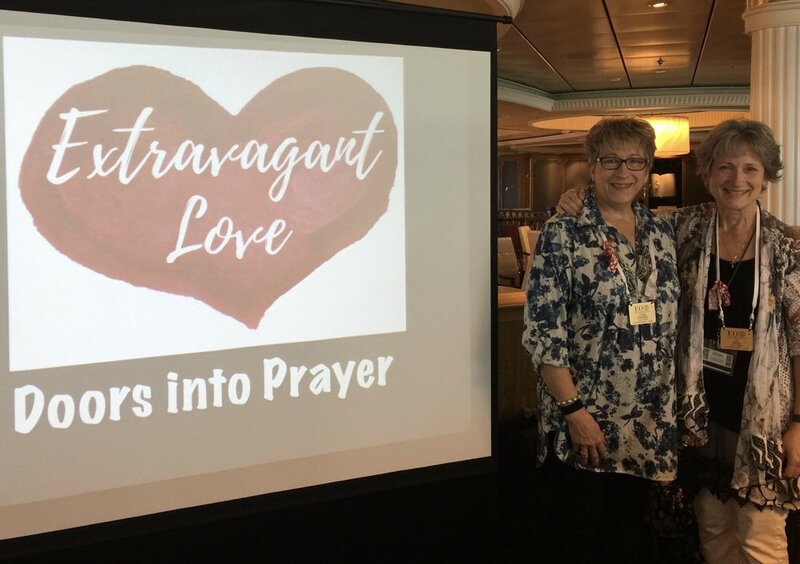 Visual Faith on the Extravagant Love Cruise! On February 9, 2019, a group of women set sail on Royal Caribbean’s Independence of the Seas for a 5-day “Extravagant Love Cruise”, sponsored by Educational Opportunities Travel. We were blessed with this gathering of Visual Faith coaches that assembled for the cruise. Front- L to R- Teresa Davis, Connie Denninger, Liz Murphy, and Webmaster- Diane Marra. Back- L to R- Peggy Thibodeau, Eden Keefe, Sara Wilson, Lisa Brass, Pat Maier and Valerie Matyas. The cruise had about the same Teaching Time as a Women’s Weekend Retreat. The rest of the time was spent personally experiencing either the Royal Caribbean ship or time off the boat. This cruise landed in Labadee, Haiti and Falmouth, Jamaica. Pat Maier helped us to see Visual Faith processes as an Act of Worship—Read, Reflect, Respond, so that you can Remember and Reach Out. She also brought helpful tools for lettering and working with color in our margins and Bibles. WendySue Fluegge and her daughter, Miranda, wove together worship and praise with their gift of music. Bible Study Leader-Deb Burma led participants through a wealth of riches in God’s Word with the story of God’s Extravagant Love for each of us. Connie Denninger led us into an introduction of Visual Faith through Doors into Prayer. The Co-Founders of Visual Faith Ministry had a wonderful experience of connecting to so many who are already faithful practitioners and those who were new to the practices. We gathered in the evenings in the Windjammer food court for times of sharing and encouragement. it was fun to meet each other In Real Life and share our Visual Faith journey. We valued our time together and seeing all the ways we are unique in this part of the Visual Faith Journey. We were blessed by this inter-generational experience aboard the Royal Caribbean- Independence of the Seas. We even had 17 brave men along for this cruise. Hardy souls and we spotted them here and there. The blessings of conversations around the dinner table……. A magnificent wait staff, beautiful sunny days in port, calm seas, and accommodations galore. This group of women from all over the country forged a new friendship of ministry blessings. A heartfelt thank you to Diane Biel (blue shirt- center) for all of her coordination and hard work and making this Education Opportunities event move from a dream to a reality. God’s Extravagant Love? Yes, we have been richly blessed. Maybe you will join us on a future cruise? We gathered in Springfield, Virginia for a Visual Faith Assembly on August 3, 2018 to bring resources and encouragement to Visual Faith practitioners. We welcomed Lutheran Social Serves- National Capital Area to the event to offer prayers and encouragement for the Immigrant Families and especially for the children in the United States detention centers. Chief Executive Officer- Christine Connell came to meet folks and head the prayer project. We are hoping to use this event as a prototype to add Visual Prayer to events and gatherings.We used prayer cards found in Resources on the Visual Faith Ministry website and then added Bible verses to pray over the families and children. 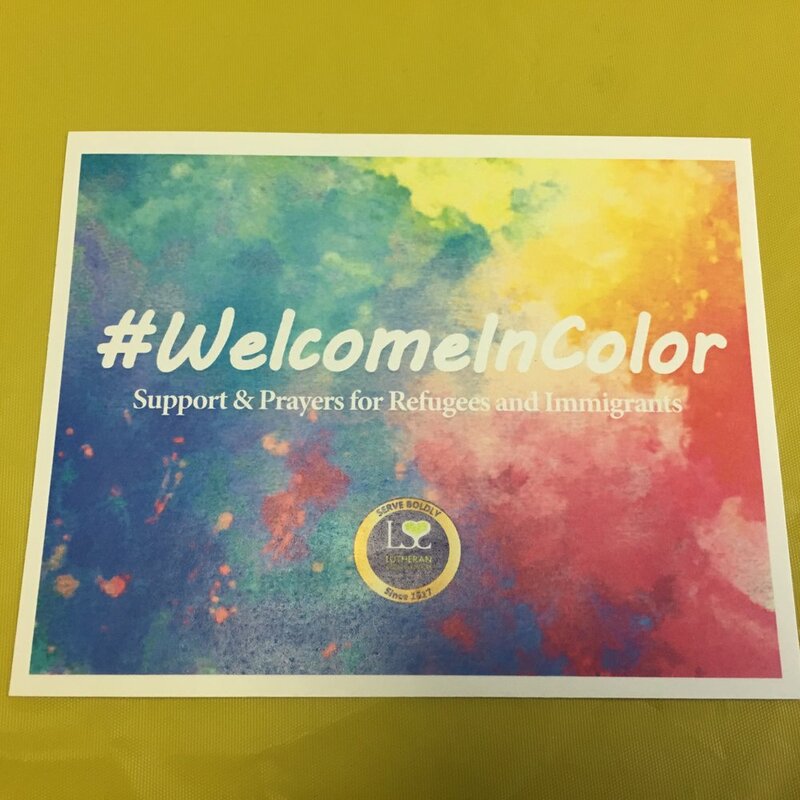 Anyone can pray for these families and share their prayers using this hashtag- #WelcomeInColor. Welcome comes in many languages. We printed off the Bible verses and then they could simple be added to the prayer cards. Prayer time finished them with watercolor and colored pencil. May these families be blessed. We also tried our hands at Polaroid Praise - watercolor and Sharpie pens on watercolor paper. Visual Faith Coach Erika Radke also helped with some string painting- In and out of our Bibles. Time to check in, encourage creativity, and see all the ways that the Lord is writing the stories in our lives. Maybe it is time for some inspiration? Perhaps you have seen some things about Bible Journaling and Praying in Color. You've thought about exploring something to bring to your congregation or share with your neighbors. Where do you start? How do you make it inviting to all- even non-artists? What if you don't feel qualified to lead ? Help ! We have heard you and invite you to join us for a Creative Faith Assembly in Northern Virginia. We will have an evening of hands-on introduction to techniques. There will be help with supplies and how to use, as well as time to try things out. We will show you what "Worship into the Week" could look like in your home, school or congregation. With YOU leading! Maybe your church gives out Portals of Prayer and a mini- calendar project makes a wonderful addition and all of a sudden you have "community" around a spiritual discipline practice. There are also some basic Visual Faith project how-tos for creating Counting gift journals and Prayers for my Children flip calendars. So find a friend to bring- that always makes it more fun. Two with a vision make things happen. Don't sit back and watch and wish you had made the trek to Prince of Peace in Springfield, Virginia. Join us!